Walking in the heart of the Fuller campus in Pasadena, you can see its origins easily. Houses were purchased on the same street; the street was vacated and grass put in; and that park-like lawn serves as the center of campus. Some of the houses are still there as seminary buildings; others have been torn down to make room for bigger library and classroom buildings. The first time I walked the green, I remember being surprised at how small it felt. I discovered quickly something I would love about Fuller…diversity. There’s academic diversity; some students, like me, in the School of Theology (SOT); some in the School of Psychology (SOP); and some in the School of World Mission (SWM). In any given class, you might find people from any of the three schools. When I went, I had been accepted to a unique program which was a bridge between the Schools of Theology and Psychology. It was a Master of Divinity degree, with a concentration in Marriage and Family therapy (MFT). On paper, it was really attractive to me; but when I arrived and realized what it meant, I began having doubts. I met with my academic advisor, and discovered that all of my electives, with the exception of 4 credit hours, would be gobbled up by the MFT concentration. And, as I looked over the schedule and saw the amazing classes offered in the SOT, I couldn’t imagine not getting to take anything except the required courses. I decided to chuck the program and go for a straight M.Div. There’s ethnic diversity; people come to Fuller from around the world. I had classes with people from Korea, Sudan, Venezuela, and Mexico just to name a few. (Just imagine the richness of studying church history, for instance, with that mix!) They even let in, get this…people from North Carolina! My first quarter, I took an intensive Greek class. It was a 12 hour class, a whole year of Greek in one 10 week quarter. Monday, Wednesday, and Friday, from 8:00 am to noon, Greek…Greek….and more Greek. The only reason I survived was UNC grad James Barnhill III. (Hey, I never thought of this; Jimmy, did you catch flak for not making Isaac numero quatro?) Hell hath no fury like four straight hours of Greek taught by an adjunct professor, and Jimmy was like the tangible grace of God. We used to sit in the corner, the corner with a wall covered by a world map. I laughed at Jimmy’s jokes, learned Greek, and probably learned even more geography from staring at the map on the wall. I think I have one regret, looking back. Jimmy was about the only friend I made, until near the end of my second year…and I wasn’t a very good friend. There are excuses, of course–I was a newly wed, I didn’t live on campus, blah blah–but if I had it to do over again, Jimmy, I’d have hung out with you more. I think the absolute best part of being at Fuller is that you were always around bright people, talking about things that are truly important. I was stretched in immeasurable ways. Many textbooks in our classes were written by the person teaching the class. I’ll close with some fun pictures. There was a great cafeteria on campus that had wonderful cooks from around the world, but the place that sort of brought Fuller to life was the Catalyst, a small eatery/coffee house. 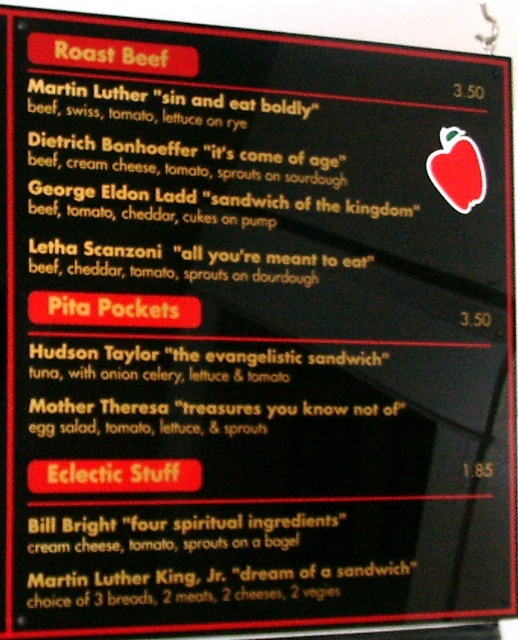 Their sandwiches were named after famous theologians. The first time I read them, I laughed and laughed…but the only one I really got was the one named after C.S. Lewis. The true sign that I learned something in my three years in seminary is that by the end, I understood almost all of the menu.